1. MH17 victims. 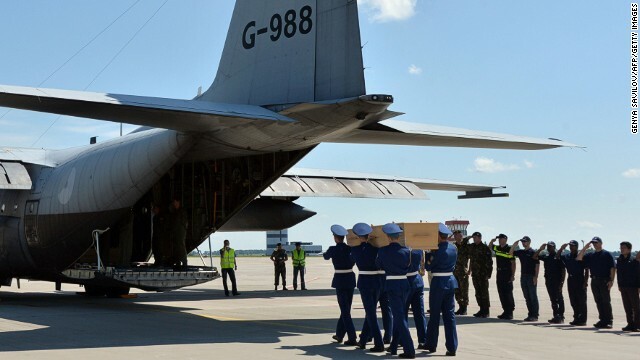 The country that suffered the biggest loss in the shoot-down of Flight 17 paused for a national day of mourning as the remains of 40 Dutch victims were returned home. 193 of the 298 people aboard the plane were from the Netherlands. The country's king and queen led the nation of 17 million in a solemn tribute. Thousands of people lined the route where hearses made their way to a forensics lab. Examination and identification of the bodies is expected to take months. 2. Israel-Hamas conflict. The FAA has extended its ban on U.S. flights to and from Tel Aviv for another 24 hours. The agency imposed the ban Tuesday after a rocket landed near Ben Gurion airport. Meanwhile the U.S. is stepping up efforts to broker a cease-fire. Secretary of State John Kerry met with Palestinian Authority President Mahmoud Abbas and is also meeting with Israeli Prime Minister Benjamin Netanyahu. Palestinian officials say 664 people have been killed in Gaza since the escalation of hostilities between Israel and Hamas. The Israeli death toll stands at 35, most of them soldiers. 3. Obama's job approval #s. They are still underwater but a new CNN/ORC poll finds no evidence that President has suffered a "Katrina moment." Forty-two percent of people questioned approve of the way he is handling his job, a number that is basically unchanged since March. "When Hurricane Katrina devastated New Orleans and the Gulf Coast in 2005, the biggest impact on attitudes toward George W. Bush came in the number who said he could manage the government effectively. That number dropped 10 points, and no other personal quality measured at that time changed as much, said CNN Polling Director Keating Holland. "Using that as a definition of a 'Katrina moment,' it looks like Obama has not experienced a similar drop in the summer of 2014, in part because his numbers already took that hit last year and have stabilized since then." 4. Obamacare. A new poll finds that more than half the public believe the Affordable Care Act has either helped their families or others across the country. According to the CNN/ORC survey, 18% said they or their families are better off now that most of the health care law has been implemented, while another 35% say Obamacare has helped other people in the U.S. Still, the poll found that only 40% of Americans support the health care law, while 59% oppose it. But some of that opposition is from people who don't think the measure is liberal enough. The survey comes one day after a pair of federal appeals courts issued conflicting rulings on a key provision of Obamacare. One court upheld the tax subsidies for the millions of Americans enrolled in the federal health exchange while a second court struck the provision down.